Restructurings are often crisis-oriented projects involving radical changes and redesign to corporate balance sheets, corporate structure, business portfolios, capital structure and financing. This is why project tools such as valuations represent a necessary part of a typical restructuring. Many restructuring projects (with balance sheet redesign) have simultaneous turnaround characteristics (including P&L/operational redesign), but not all. For example, some companies may have restructuring requirements concentrated to loan portfolios or corporate structure without significant impact on day-to-day operations. Restructurings are also on the agenda when a company changes its core strategy and consequently wants to spin-off or divest a company or business unit. This may require a complex re-allocation of assets – or changes in production strategy, suppliers, financing or capital structure – which include many elements of a full restructuring. A de-merger has the same characteristics. 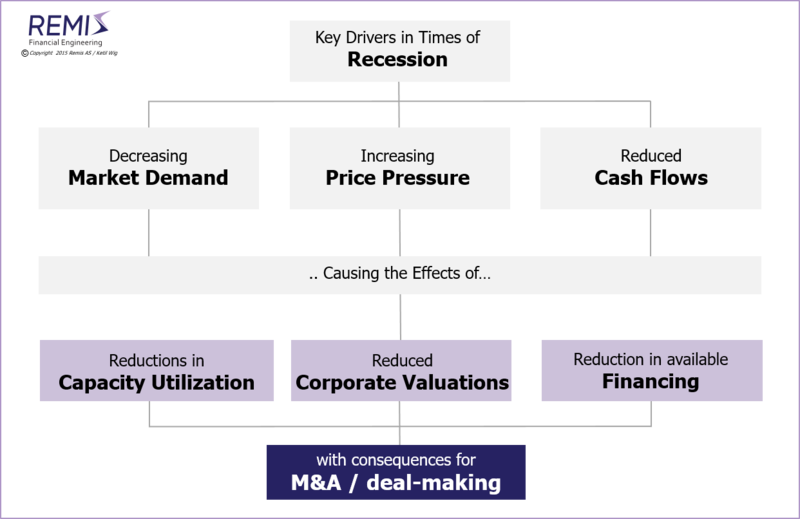 The below illustration shows how the effects of recessions drive the second order consequences which typically initiate the need for restructurings: low capacity utilizations, low corporate valuations and unavailable financing. Project management of restructurings typically requires the balancing of interests between various stakeholder groups such as owners, creditors and banks/corporate lenders. Also read the separate articles on Strategy Implementation and the Lack of Results, on Developing High Quality Business Models; on Strategy and the Proper Use of M&A Tools, on Buy-Side M&A, on Sell-Side M&A, on Synergies and Poor Judgment, on Financial vs. Industrial Ownership, on Equity Based Financing of Start-ups, and on M&A Process Management. Remis AS and Ketil Wig offers advisory and consulting services to foreign owners, handling key priorities related to investments and operational assets in Norway. Typically restructuring assignments are either related to distressed balance sheets, or they are part of a corporate redesign preceding a de-merger/spin-off or a divestiture/trade sale. 15+ complex negotiations/restructurings – both crisis and strategy oriented. Focus on redesign and implementation of radical changes in balance sheets, corporate business portfolios, company structures and capital structure/financing. Balance sheet size of US$30-400M.